We offer a full line of adjustment and regulation tools for all types of pianos. Well, we all get loose in the joints as we age, so lay off your complaining about your Baldwin, OK? This is the most basic adjustment, and the most urgent adjustment you can do to your own piano. It is sadly common for tuners to leave it and run to the next tuning. It is quite simple to take out the lost motion in an upright, but a lot of trouble on a grand. So let's help you do it yourself. First, what is lost motion? This is caused by age and wear. The Diagrams of the Grand Piano (See part 24) and the Upright Piano (See part 10) will show you the capstan which takes the force of the blow on the key lever up into the action. Check the diagrams so that you know what we are talking about. When the felt which the capstan pushes wears, and when the balance rail (center rail) felts wear, the net effect if for lost space to develop between the top of the capstan and the wippen, or on the upright, the sticker. The smallest amount of lost motion can set the whole action off, and you don't get the amount of blow needed to get good response and good repetition activity from the action. So, let's get on with this task. Test for lost motion by slowly depressing the key down. Is there ANY travel of the key before the hammer starts to leave the hammer back rest? This is easy to watch with the upright, but with the grand you will need to stand with your face over the hammers, desk out of the way, and watch the hammers carefully. If the keys drop some without the hammers leaving the rest, you have lost motion. This is not nearly as bad as having fleas, but you need to proceed with this task. Even a sixteenth of an inch of lost motion can cause trouble. Also, you can tell that you have lost motion if the hammers are hitting double blows when you hit a key moderately. The jacks may also need adjusting, but this lost motion fix MUST go first. Also, DO NOT bend the back checks to make this adjustment. Any piano tuner who bands back checks, rather than make a proper adjustment, is a real jerk. The only time to bend back check wires is when all other measures have been tried, but there is still a problem with hammer activity. A. This is usually a very old capstan common on old uprights from about the 1890s to 1940s. It is wooden on a metal post, and when you start to turn it, inserting a tool in the holes provided, it may just rupture and break. So use needle nosed pliers to turn this capstan. Some recent Japanese and Korean pianos have returned to this capstan. C. This capstan has a square shank just under the top of the capstan. You should order the tool from our Online Catalog. With the action at rest, slowly unscrew the capstan from the wood of the key. For the "A" type capstan, hold the wood part with medium needle nosed pliars and try to compress the wood a bit in two positions to loosen the wood in case it has bonded to the wire due to rust. As you turn the capstan, watch the hammer above. When it starts to move away from the hammer rail or rest, you have gone too far. Back the capstan down until the hammer rests again. Some pianos need just a tiny bit of lost motion to work right, especially some old ones. Consoles and studio pianos will be the same in princilple, but the capstan will come up against the under side of the wippen, into which a piece of felt has been embedded. With the spinet, locate the nuts at the top of the wires that come up from the depths of the action. These nuts may be rubber, wood, or metal. Test for lost motion the same way, but, to get rid of it, tighten the nut slowly until the lost motion is gone. If it is really tight, hold the wire in needle nosed pliers just below the nut so that it doesn't rotate in the elbow down below and break it. Some spinets have curved extensions on the ends of the key levers which dive down under the drop action. There may be a metal extension used. In this case, you will have to remove the key over and over, turning the capstan, until you have the lost motion eliminated. The Acrosonic Baldwin I believe has capstans which come up under levers which operate drop wooden stickers. Use the same technique as above on these capstans. Some very old uprights have a strange device made of a wood lever and two screws. 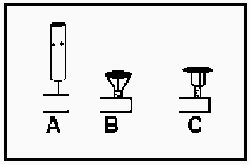 You will loosen one screw and tighten the other to rock the lever under the sticker, or the stump under the wippen, in order to eliminate the lost motion. The principle is the same in the grand piano, but it is harder to do, and you look at things from a different angle. If you have your grand fall board removed, do it, even if it drives you nuts to get at the capstans back under the action in the center of the keys. Again, unscrew the capstan until the hammer begins to rise, then back off until the hammer rests. This can be done in the piano with the key cover (fall board) out of the piano. You will need a long tool to do this, so order a long version when you order parts from the Online Catalog. There is a tool for the square shouldered capstan and one for the capstan with the hole in it. With old spinets with the rubber nuts, the nuts will very likely disintegrate as you try to turn them. If the hammers are double hitting, ba-bang, you have to proceed. If the rubber nut goes to pieces, don't you do the same. Get some GE silicone in a tube at the hardware store, and after the note is correctly adjusted, put a dab of silicone on the nut-to-key mounting point. Don't play it until it drys. If the top of the rubber nut is the only thing that held it in place, unscrew the remains of the rubber nut, and put a small washer between the top nut of the wire and the tab on the end of the key, then silicone it all generously as above. All's well that ends swell (old Chinese American saying). You may also buy new rubber spinet nuts or wooden capstan or spinet nuts from our Online Catalog.